Worms Blast is the latest instalment of the ever popular Worms series. This title takes place on the high seas and comes a equipped with a variety game modes and options. For those new to the series, Worms will initially look and sound disappointing. However, persevere and you'll be extremely impressed. The idea behind Worms games is to test your puzzle solving skills and quick reflexes. The game has an extreme arcade type feel to it and we feel perhaps its greatest strength is in the absolutely awesome multiplayer mode. There is nothing more satisfying than being the last Worm floating. Because don't get us wrong, these Worms come equipped with all sorts of weaponry, including canons, piranhas, sea monsters and fish food. One of the cool things about Worms is the sheer simplicity about the graphics. The entire game is designed to appear rather cartoony and whilst suiting the game perfectly it does not detract from the task at hand which is solving problems. Worms is a highly addictive game that will suit players of all ages. One of the confusing things about Worms Blast is the fact that lovely as the background graphics are, it is easy to confuse one game mode from the other. Worms Blast includes many old and favourite characters from the previous Worm games such as Calvin the Super Sheep, Ethel the Old Woman, Stavros Skunk and Rocky the whacky Concrete Donkey. 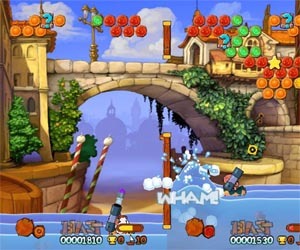 Most games involve the blasting of descending cells upon the players. The idea is to keep the cells at bay and free new items to use against your opponent. 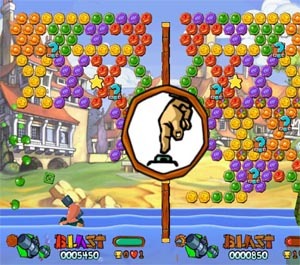 In the two player mode, there are dividing logs in the center of the screen, when these separate all mayhem breaks loose! In single player mode, longevity is assured as there are over 60 different levels of fun to explore and solve. Worms Blast caters for all intellects and is configurable enough to provide you with an easy going game to an all out war against the opponent AI. One of the really cool things about this game is that its the sort of title that can definitely be put to use at a party. The nature of the game is such that even a large group of friends can take turns against each other and the nature of the competition as such, that even on lookers will have a blast watching, no pun intended! 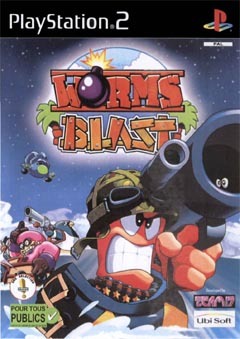 Worms Blast is one of those games that you will keep coming back to and it will be a great part of your Playstation 2 collection!